Here is my first throwback post to the start of this adventure in April 2016. This was, of course, long before deciding to blog about it. The start of the month found me in Europe, and it was there the idea struck me: I need to see more of my own backyard! 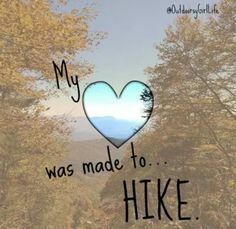 So here are my first hiking trips, starting the week after my arrival home. 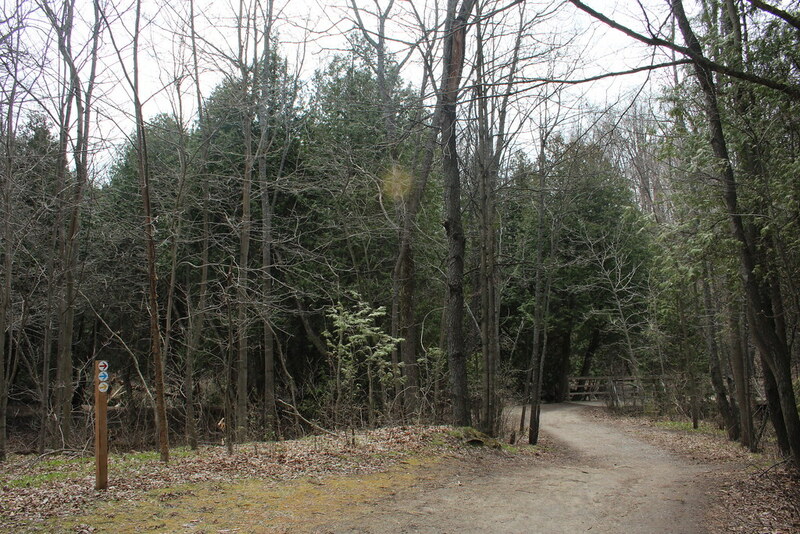 These include Smokey Hollow along the Bruce Trail, and Albion Hills Conservation Area. 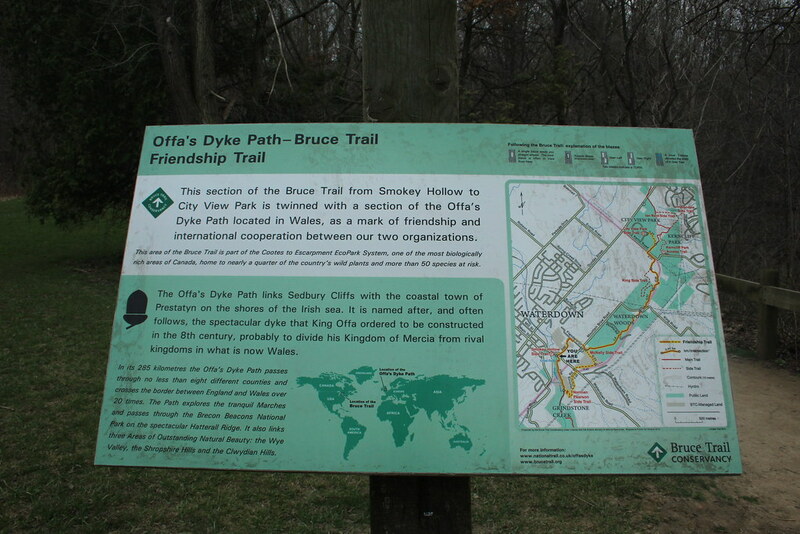 The Bruce Trail is the oldest footpath in Ontario, and the longest, second to only the Trans Canada Trail. In my mind, this made a good starting point for my new adventure. This was a quick 3.4km loop. I have no recollection of how I ended up stumbling across this particular hike. It was definitely a Google search, but the keywords are lost in memory. 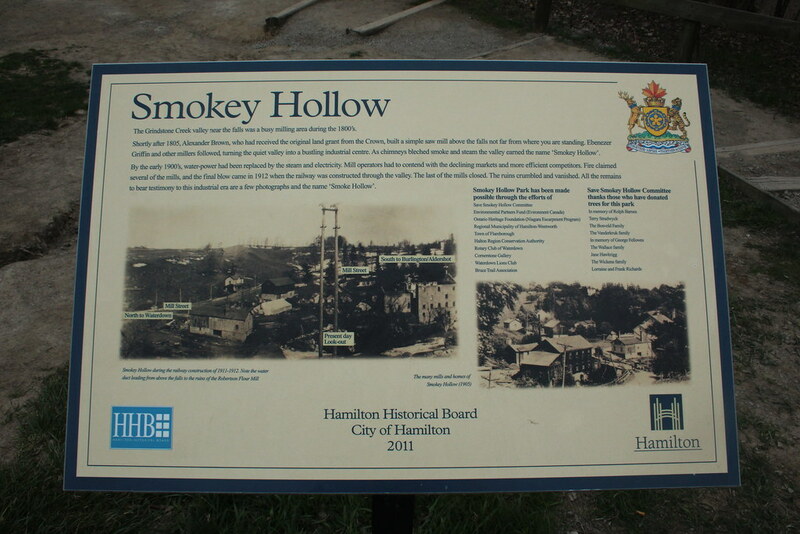 Smokey Hollow has a lot of great interpretive signage. 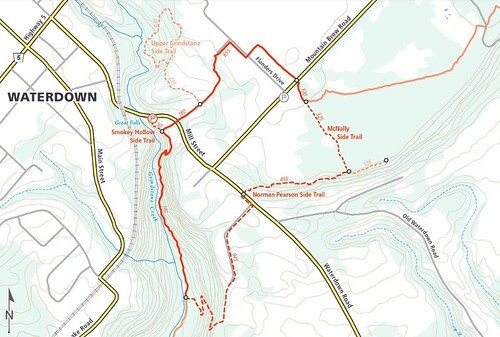 You get a hike and a history lesson, all in one here! 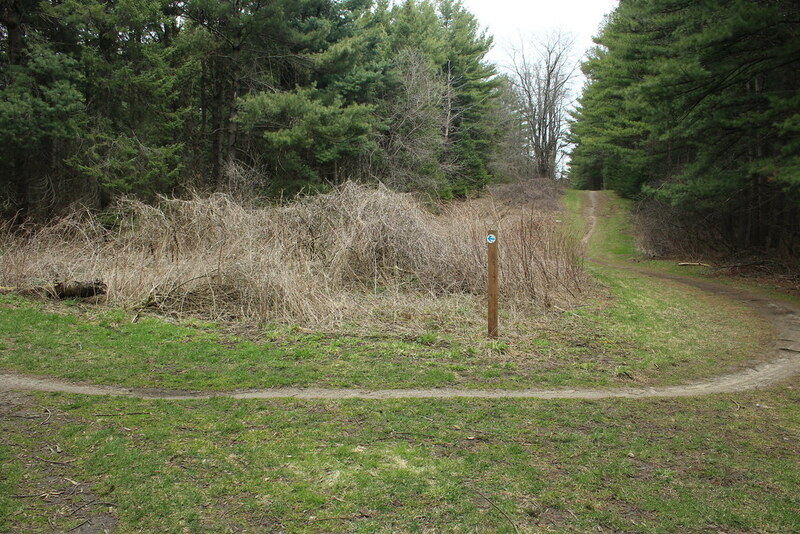 It’s also twinned with a trail in Wales. I don’t claim to understand this entirely. 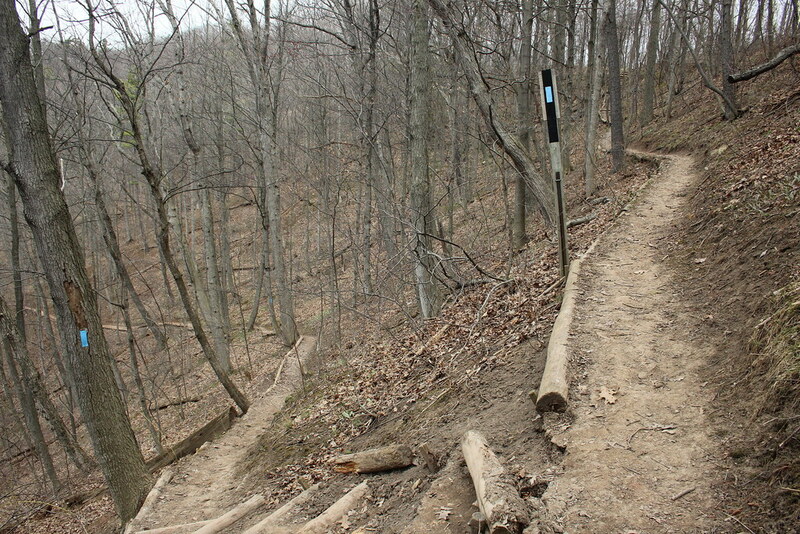 This section of the Bruce Trail through Smokey Hollow is quite steep. While there are a few sets of stairs to assist, I would still rank this section somewhere in the moderate-intermediate range. 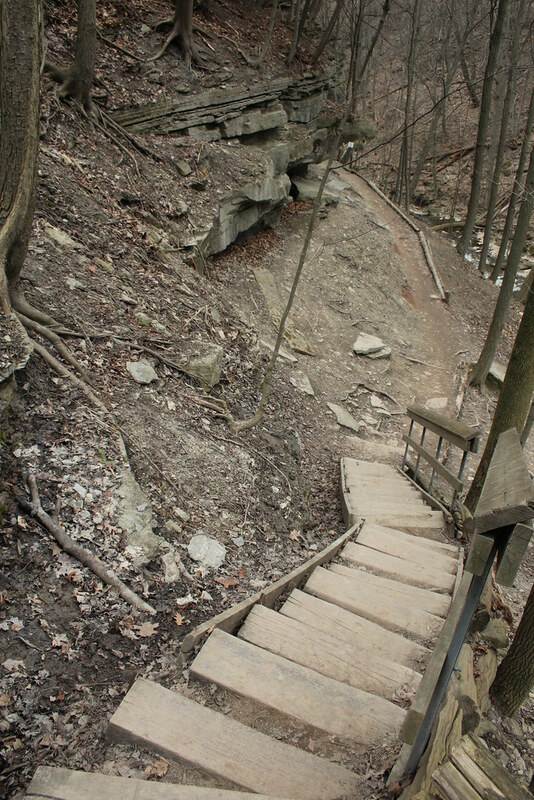 At the bottom of the stairs, many curious people have paved an unofficial path over to the edge of Grindstone Creek to get a better view of the Smokey Hollow Falls. There is a viewing platform above, but it really doesn’t afford much of a view. 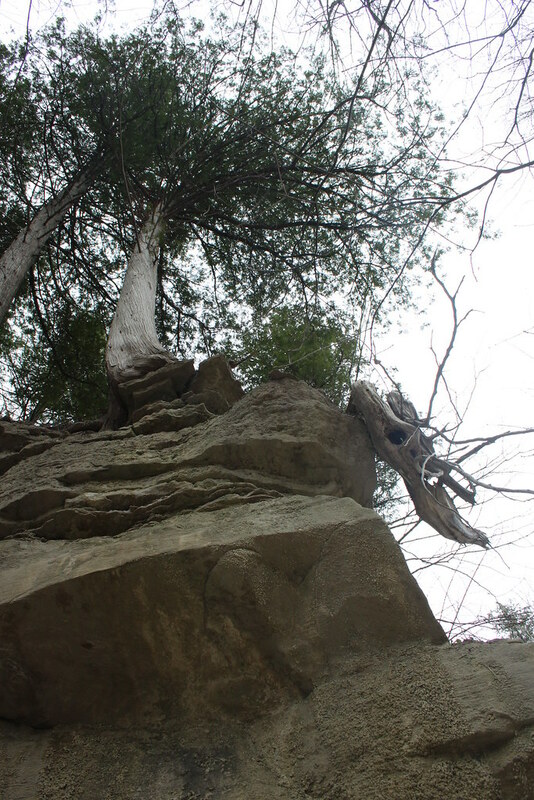 The creek valley walls soar above your head here. And trees seem to be barely holding on. 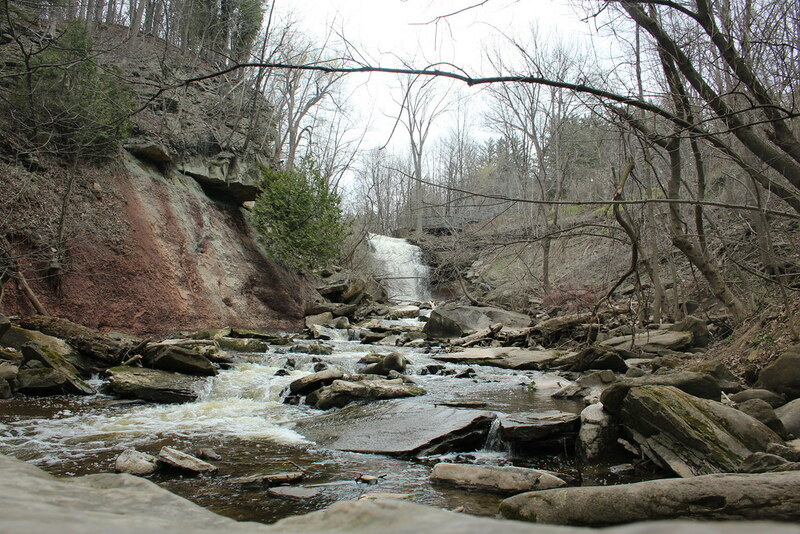 The Bruce Trail follows Grindstone Creek away from Smokey Hollow. It’s a very stony creek. 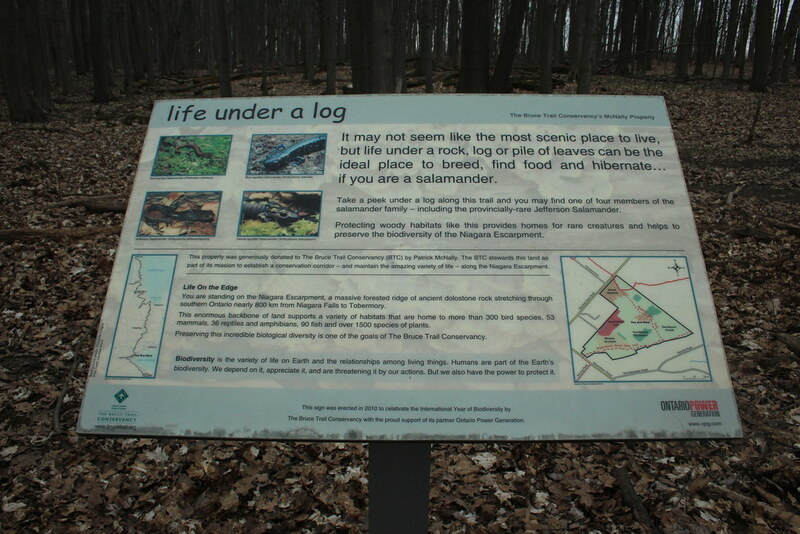 More interpretive signage for those minds that need to know. This stretch is a nice one. It gives you a bit of a breather before trying to kill you when the loopback comes with the side trail. The Norman Pearson side trail veers left from the main Bruce Trail, and immediately heads up the steep banks of the valley. And you keep going up. Seemingly, neverending up. Once you’re at the top, it’s another simple stretch – this time you follow a road past some quaint little houses. 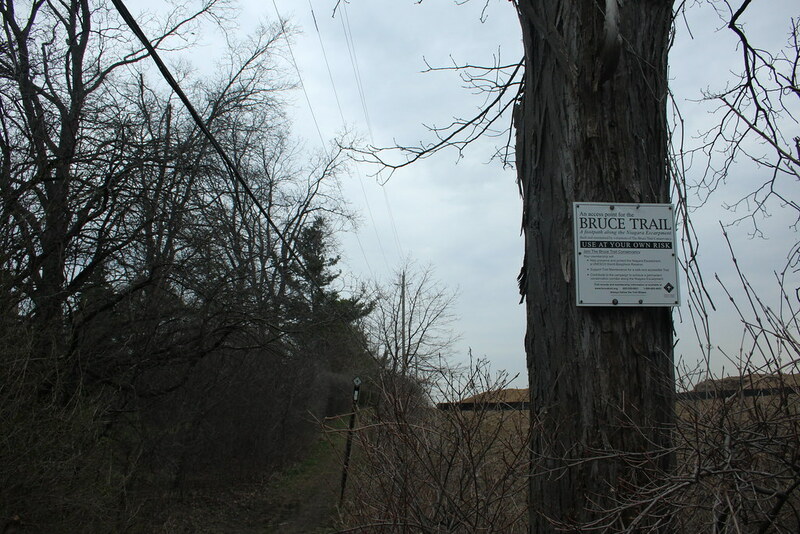 More interpretive signs await you near the end of the Norman Pearson side trail. 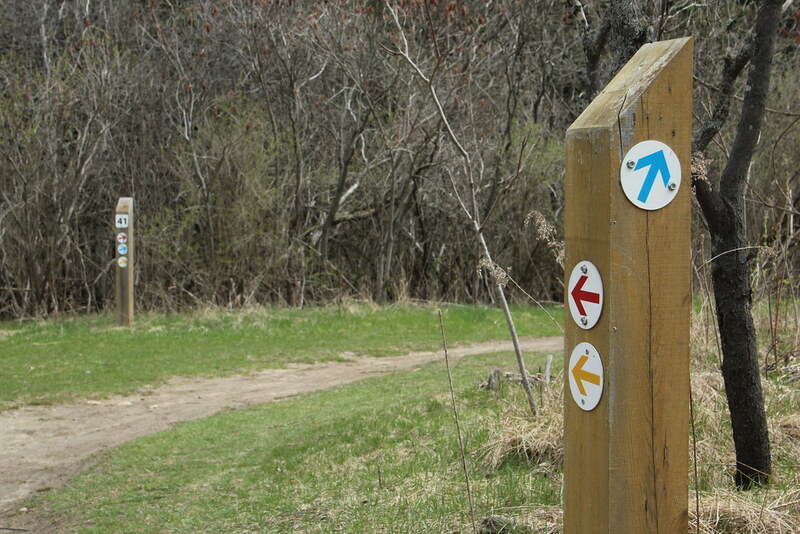 Here, you meet up with McNally side trail – to the left you continue with the loop, but you should take the time to head right and complete the other 50m of the trail. On a clear day, you’ll get a nice view out from the escarpment over Hamilton and the harbour. 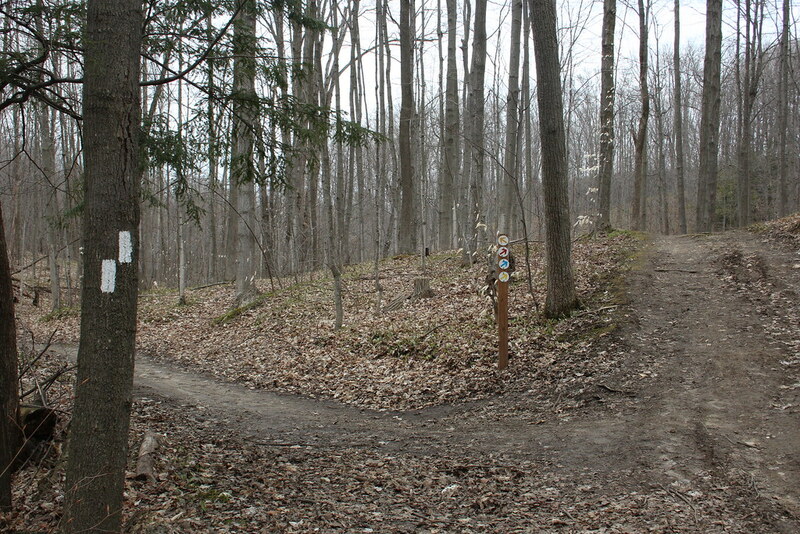 Follow the McNally side trail back out to the main Bruce Trail and keep left. Shortly, you’ll come to a stile to get you over the fence to cross Mountain Brow Road. Here you skirt the edge of a field then cut through between some houses. 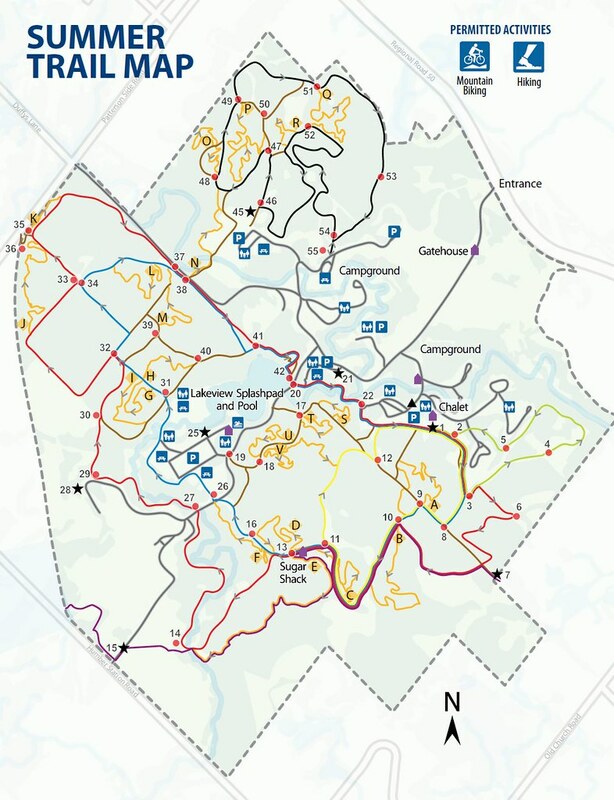 You will end up on Flanders Drive – head away from Mountain Brow and take a left on Renwood Place. This piece is not well marked, though that might have been because it was under construction when I visited. 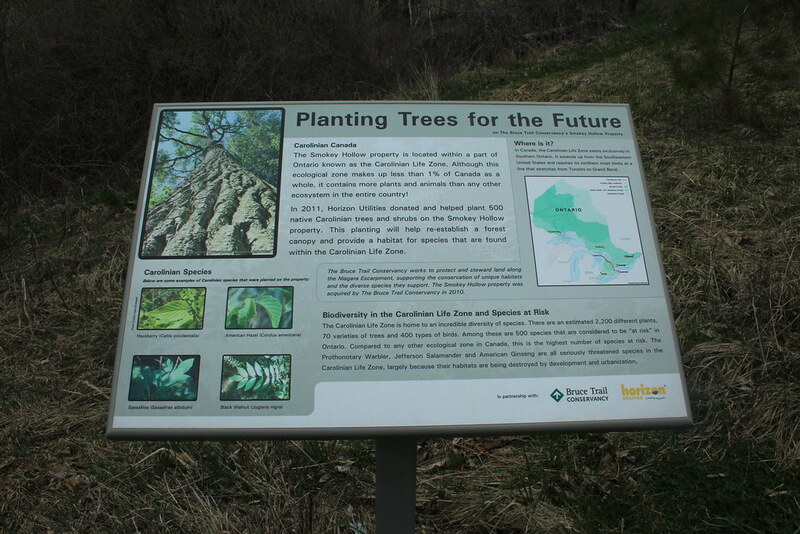 This is a nice stretch of wooded area, with some plaques on trees. 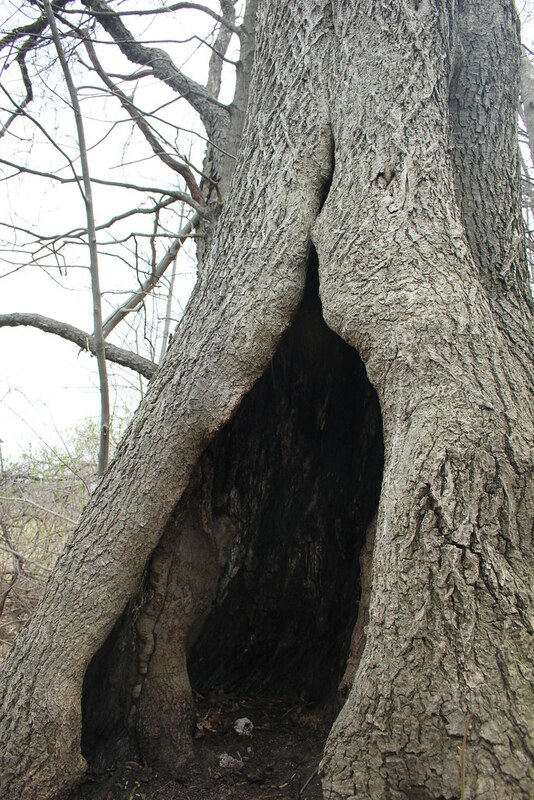 And some oddly torn open trees. I think someone might be living here. Another interpretive sign, and you’re on your way across a wide open field. 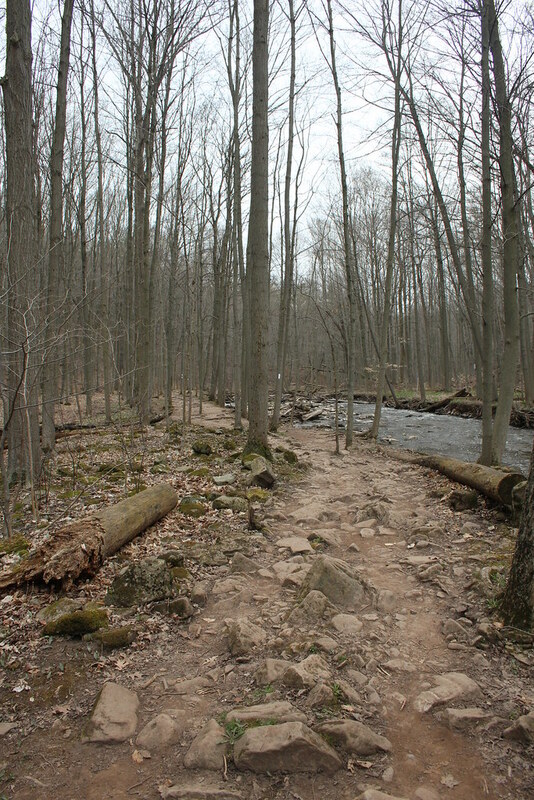 There is another side trail, off to the right along this stretch, called Upper Grindstone side trail. I didn’t get a chance to visit as it was just starting to rain at this point. I hurried back to the car instead. There are something like 36 Conservation Authorities in Ontario. 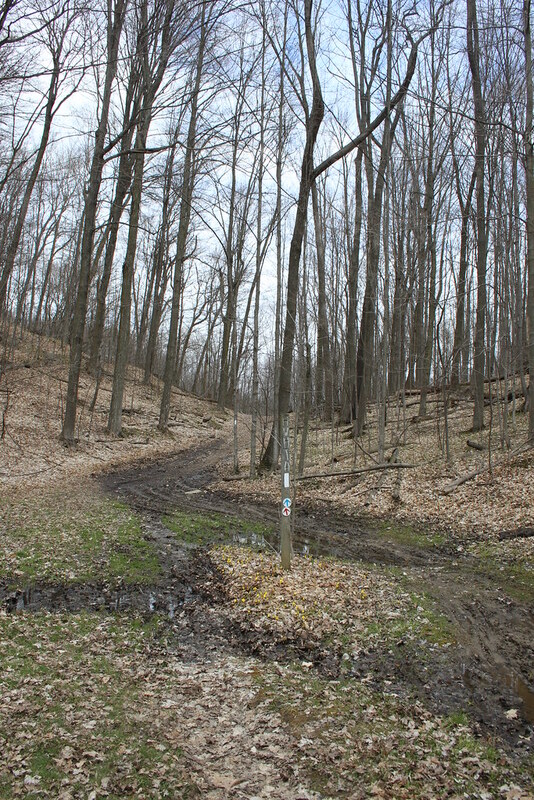 Albion Hills is maintained by the Toronto and Region Conservation Authority (TRCA). 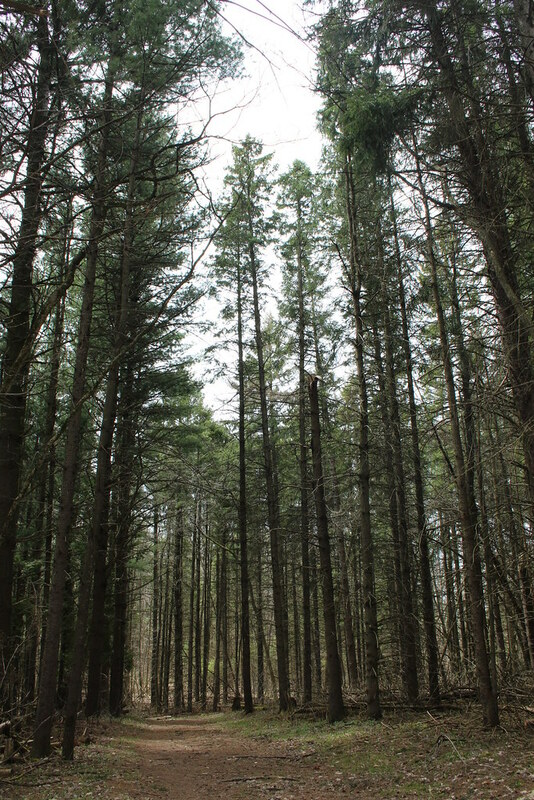 Albion Hills is also open year-round. I was visiting in shoulder season, but since the snow had (barely) lifted, I ended up following the summer trails around. 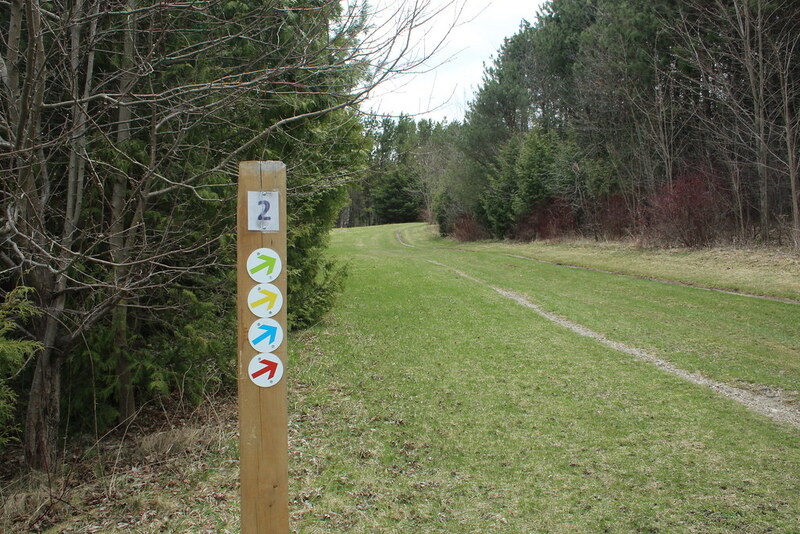 This added up to about 6km between the Blue and Red trails. From the parking lot by the splash pad, I may have taken a bit of an off-trail route to reach the Blue trail more directly. 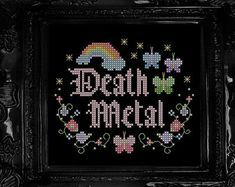 Whatever. 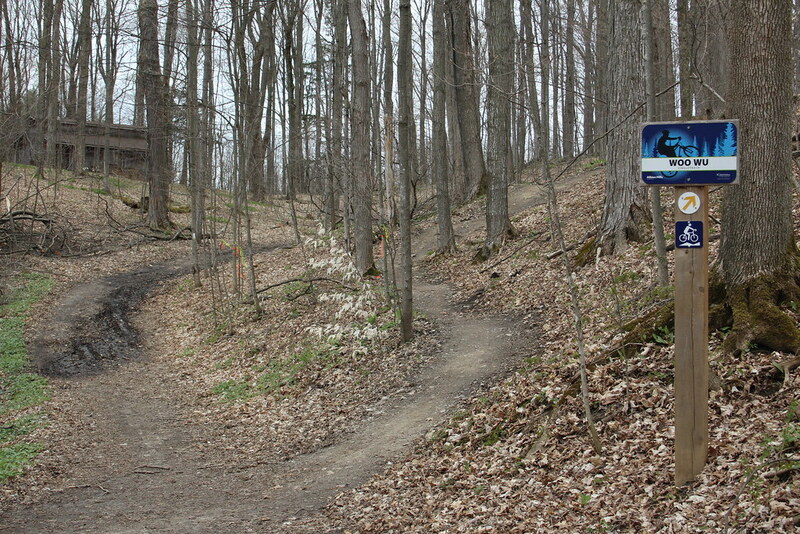 Along here, the trail is dedicated to Terry Carr. 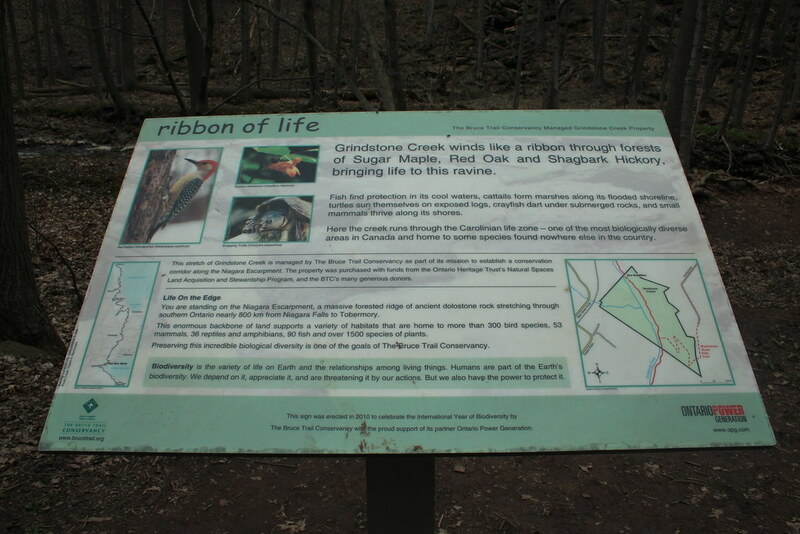 There are a number of interpretive signs for all sorts of birds and plants. 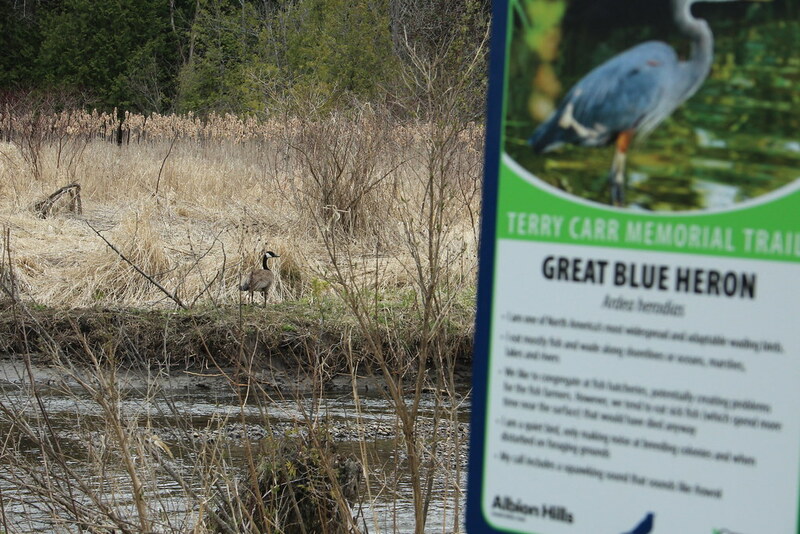 But don’t always believe the labels – I’m pretty sure this one is NOT a blue heron. 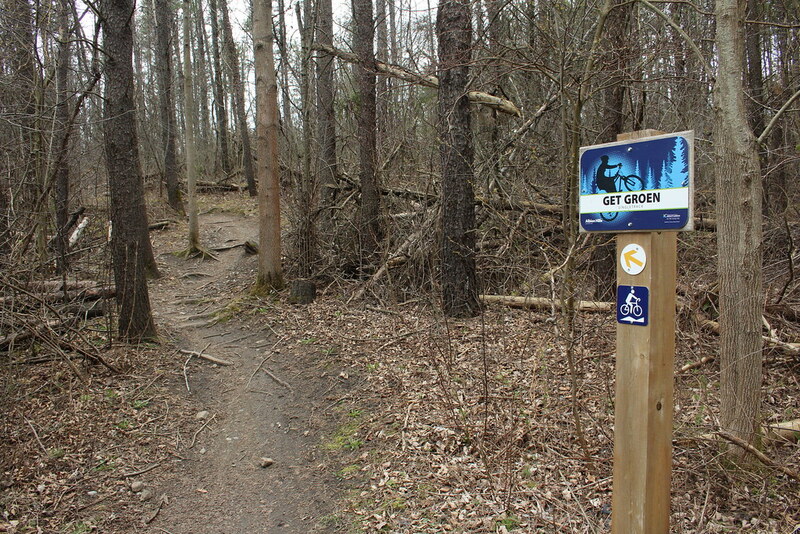 Aside from all the great hiking trails, Albion Hills has a wide assortment for biking as well. I was tempted to venture down a few, but I behaved. 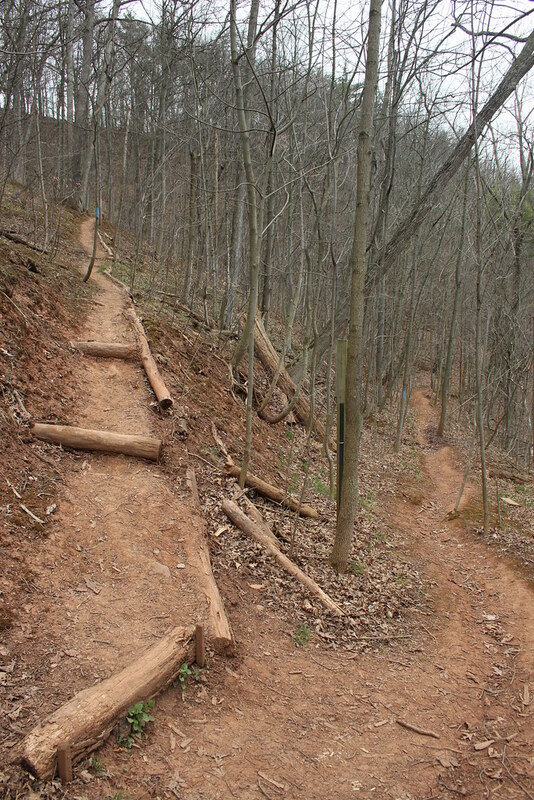 The trails are wide and well taken care of here. This makes for a great family trip. I would recommend picking up a brochure at the gatehouse. 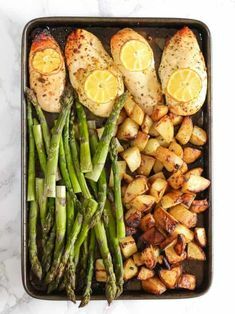 While there are a lot of markers, and they do a good job of directing you, sometimes they are a little contradictory. 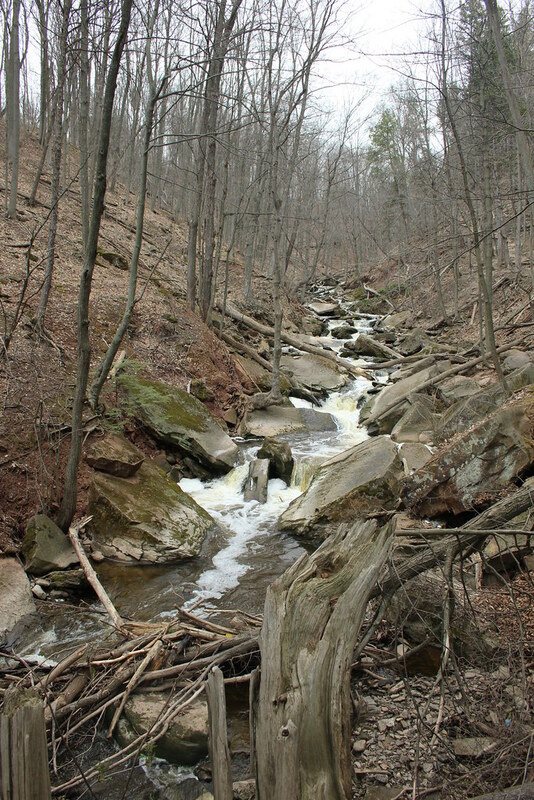 The creek that winds through the park shows evidence of some good fishing. Along the bring, there are quite a few bobbers snagged in the branches above. 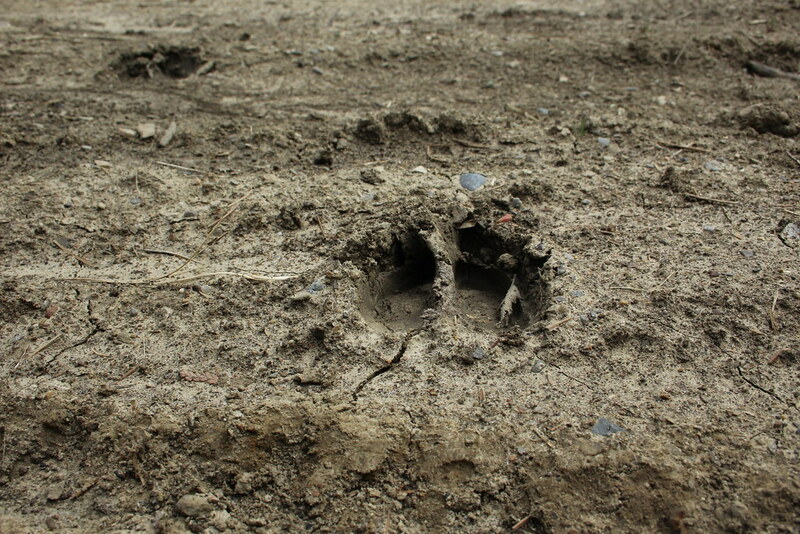 I enjoy mud for this reason only: capturing the evidence of wildlife. This is where you could start if you park by the Chalet. 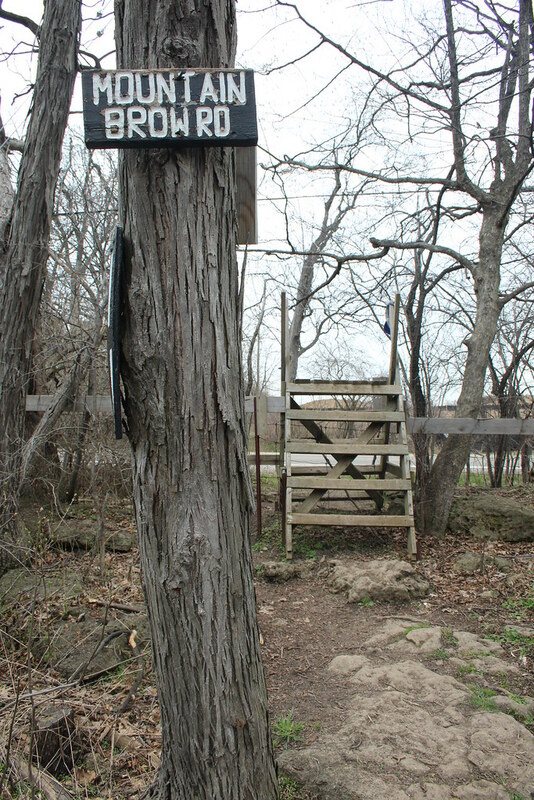 Trailmarker #1 is the main trailhead with a map. It’s unnumbered though, so don’t waste your time looking for it like I did. 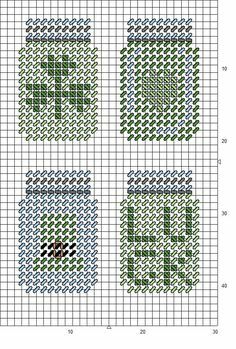 Evergreens and grass – as if Spring never left. 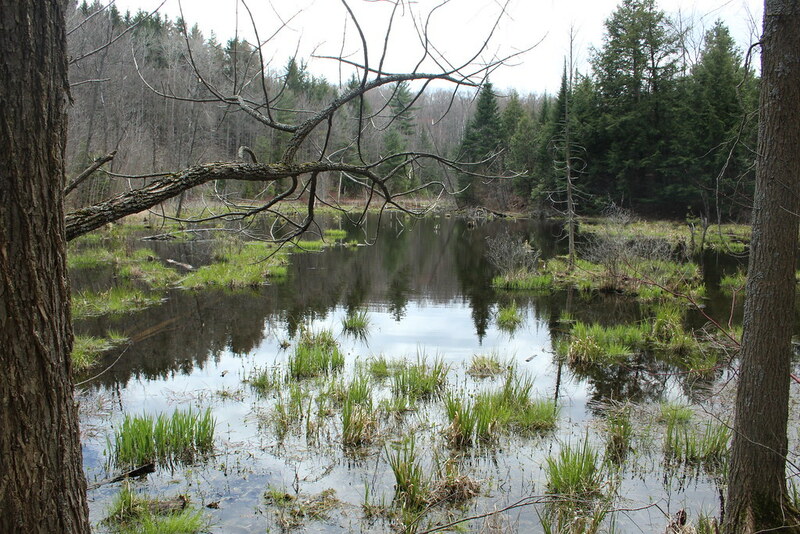 One of the many pretty little ponds on the property. I startled a goose couple and the hid behind the reeds. And this was where it got messy. For whatever, this hill retains its water content much more than the rest of the area. Still not complaining. I got off pretty easily for all the hiking I do in Spring. A bit more mud outside the Sugar Shack. I took a detour along Woo Wu to avoid some of it. And then it’s a quick hop across the park road and we are back at the car. Check out my Never-Ending Bucket List of Trails to see where I’ve been and where I’m going!